Santa Monica College is a local community college located in Santa Monica California, that strives to create a learning environment that both challenges their students and supports them in achieving their educational goals. They prepare students to contribute to the global community as they develop an understanding of their personal relationship to the world's social, cultural, political, economic, technological, and natural environments. 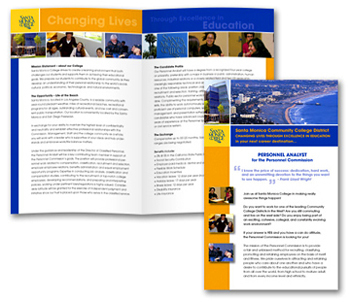 Santa Monica College needed help in developing a brochure for their recruitment campaign. They wanted to attract as many qualified applicants as possble. The challege was to develop a brochure that would be eye catching yet conservative, that potential applicants wanted to work for. The solution was to play off what a fun and wonder place to work at. The use of blue and oranges to attract attention. Relating it to the beach, sun, blue skies and ocean where the college is located. As a result, the recruit-ment campaign was a great success.